Immunogen: Synthetic peptide corresponding to aa 557-571 (CS557RRAPGREKERRAAG571) of human dishevelled 1 protein. 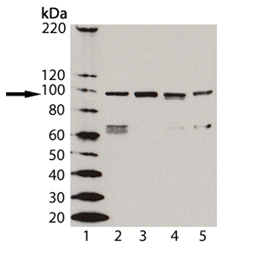 Application Notes: Detects a band of ~85kDa by Western blot. Blocking Peptide: For Blocking peptide see Prod. No. BML-DP9417. Formulation: Liquid. In PBS, pH 7.4, containing 10mM sodium azide. Scientific Background: The Drosophila segment polarity gene dishevelled (dsh) encodes a glycoprotein which has been shown to be the convergence point between the wingless (Wg) and Notch signalling pathways. Homologous genes have been identified in mammals, and three isoforms of dishevelled (dvl-1, -2 and –3) are now known to exist in humans and mice. A rat dvl-1 homologue has recently been described. Each isoform contains distinct domains – N-terminal DIX (domain present in dishevelled and axin, also known as DAX), PDZ and DEP (domain present in dishevelled, Egl-10 and pleckstrin). The DIX domain is important for protein-protein interactions and for the regulation of β-catenin stability, whereas the DEP domain transduces signals to effector proteins downstream of dvl in the Wnt (mammalian Wg homologue) pathway. Recently, dvl-1 has been shown to regulate α-secretase cleavage of amyloid precursor protein (APP), via JNK, PKC and MAP-kinase signalling. As dvl-1 inhibits GSK-3β activity, both reducing the phosphorylation of tau and regulating microtubule stability, dvl may be of particular importance in the maintenance of neuronal structure and function. Western Blot analysis of Dishevelled-1 pAb (Prod. No. BML-DA4170): Lane1: MW Marker; Lane 2:PC-3 Cell Lysate; Lane 3: Jurkat Cell Lysate (Prod. No. ADI-LYC-JK100); Lane 4: 3T3 Cell Lysate (Prod. No. ADI-LYC-3T100); and Lane 5: PC-12 Cell Lysate (Prod. No. ADI-LYC-PC100).